The Vive has come to be considered the cream of the crop in terms of virtual reality experiences. 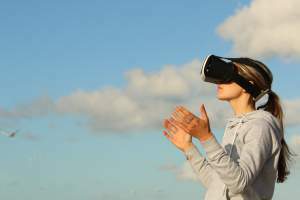 Its chief drawback is its price; many technology adopters don’t necessarily want to spend $800 for a new VR system. That being said, the majority of VR game developers are developing for the Vive rather than the Oculus Rift, but to run this system, your computer has to be ready for it. The Vive requires a fairly high performing PC, so if you plan on taking your Vive experience on the go, you’ll need a powerful laptop with a NVIDIA 970M-series graphics card or better. For a detailed, pound-for-pound review, Digital Trend’s write up about the Vive is great reading. An Intel Core i7-7300HQ processor or better – personally, I would shoot for an i7-6700HQ or i7-770HQ with a quad core so that you don’t experience framerate lag and stuttering. Nvidia GeForce 1060 or better – this is the base level, but for the best performance, you should shoot for a laptop with a Nvidia 1080 GPU. Two USB 3.0 ports – this is so that you can establish a connection to the Vive as well as the lighthouse motion trackers that you have to position around your room. Windows 8 – while Windows 8 is the base level that’s required for the Vive, I recommend using Windows 10 for a better overall virtual reality experience. 8 GB of RAM – This is probably the least demanding requirement for the Vive, though, for true performance, I’d try to find a laptop that has at least 16 GB of onboard RAM. An HDMI 1.4 or Display Port 1.2 connector – Using either of these connection types will allow you to input your Vive into your computer so that it can be used as a primary display device. You can go with newer versions of these jacks, but there will be very little performance differences. Some of the features that make other laptops excellent aren’t required for the Vive. While I’d tell you to shoot for a lighter weight with most laptops, the Vive already comes with several required peripherals that can be somewhat bulky, so an 8-pound laptop shouldn’t be an issue. While you don’t want to pick a machine that’ll break your back, you’ll probably have a case for your laptop like the carrying options in this VR Heads article. While it’s great to have a laptop that can display 4k resolution, it’s not as much of a major consideration with the HTC Vive. This is because the screen is on your head and already has a fairly pixel rich display for you to use. While you will most likely use the laptop for applications outside of virtual reality, you don’t have to shoot for a super high-res option if you’ll primarily be using it for Vive gaming. While the play area is fairly negotiable, the Vive, like other virtual reality systems out there does need a certain amount of space to be viable. Fortunately, a laptop takes up very little space and will be one of the smallest components of your virtual reality setup; next to the actual headset and the Vive’s excellently futuristic controllers. At maximum, you’ll need a 16 foot by 16 foot square. At base, you need a six and a half foot by five foot space. If you are looking for a laptop that will give you the gaming experience you want without any lag, then this entry level VR enabled a laptop is a great option for you. This device has an i7-7700HQ processor, which is a great processor for accommodating most of the games on the market. It has a graphics card that is designed to accommodate high-end games, and it has 16 GB of memory to make sure the game runs smoothly. The best feature of this device is the fact that it has Nahimic Virtual Surround sound so that the graphics and the sound can fully immerse you in the virtual experience. With that being said, I feel that this laptop could have a bit more storage. A 250 GB SSD is not big enough to accommodate all of your games and game saves, let alone other things that you may keep on your laptop. The next laptop on this list uses the same exact processor as our first model, which is the i7-7700HQ; proving once again that it is a great gaming laptop chipset for those of you who want to experience VR without slow down. If you enjoy streaming your games for others to see, you will be happy to know that the graphics card on this device, the NVIDIA GeForce GTX 1060 will be able to provide a display that is crisp. In addition, one of the best features the XSplit Gamecaster and Broadcaster that you will get with the device, which is ideal for live streams. The one issue that I had with this laptop is that it has a small 14-inch screen, but if you are only using it for the HTC Vive experience, then you may not require a larger display, especially since the resolution is 2560 x 1440. As a gamer myself, I absolutely love this laptop for the HTC Vive experience. It comes with a Nvidia GeForce GXT 1060 graphics card, an i7-6700HQ processor, and 16 GB of memory to bring you an unparalleled gaming experience that can feel like the most immersive experience possible. The display makes games like the Witcher 3’s fantasy environments look truly fantastical. It’s only 1920 x 1080, but even standard HD looks great because of Razer’s display tech, which reproduces 115 percent of the sRGB color scheme. The design of the laptop is sleek and stylish, but the first thing that I noticed was the Chroma keyboard that can be configured by color to enhance your playing experience. The keyboard also features anti-ghosting, which means that you will not lose your keystrokes as you are gaming. The battery life on the Razer Blade is great; in fact, it will last about 2-3 hours of gameplay on relatively recent games like “Doom” without being recharged. The only issue that I really have with this laptop is that it has so many great components, but no method of keeping them cool, which means that after an intense gaming session, you may find that the laptop is running hot. The next laptop on our list is a great option for HTC Vive. The processor in this device, which is the Intel i7-6700HQ, goes perfectly with the performance of the NVIDIA GeForce GTX 1070 graphics card. There is an amazing amount of RAM in this laptop; in fact, the 32 GB makes it the largest amount of RAM on this list. I was unimpressed when I found out that this laptop did not have an optical drive. A lot of games can be downloaded online, but some games still need to have a disc inserted into the system, and the lack of a disc drive can limit the games that you have access to. That being said, there is still a large library of options, and the laptop has plenty of storage to save all of your game data. It has a 500 GB SSD as well as a 2,000 GB HDD, so you will not run out of space before you decide to upgrade to a newer laptop. The final laptop on our list is one that has a performance level that is very similar to gaming to what you would expect from a desktop computer. The processor in the device is the seventh generation Intel Core i7-7700HQ, which is perfect for optimizing the performance of your HTC Vive experience. The NVIDIA GeForce GXT 1060 is a great VR ready graphics card that will give you an immersive experience, and the storage space is the biggest that we have seen thus far; in fact, it has a 1,000 GB SSD and a 2,000 GB HDD, so you will never run out of space. One caveat, though: with all of this power, the laptop does not tend to live much longer than three hours without plugging it into an outlet. It also tends to run hot, so make sure that you have alternative cooling options if this is an issue during your VR experience. The HTC Vive is an amazing system that can be significantly supported by any of the machines that we’ve covered in this review. I find that the best laptop for HTC Vive will be one that will remain supported as Steam and HTC add incremental updates, which means always shoot for the most powerful device available. If you have questions about anything pertaining to the Vive or the laptops that we’ve outlined, shoot me a comment; I’ll respond as quickly as I can. I am looking for a new laptop that I can use with the HTC Vive. What do you think of the CUK HP Omen 17 Gamer 4K VR Laptop (NVIDIA GTX 1070 8GB, Intel i7-7700HQ, 32GB RAM, 512GB NVMe SSD + 1TB HDD) – Best Ultra HD VR Ready Gaming Windows 10 Notebook Computer from Amazon? I have a big screen TV and would like to screen share my HTC Vive experience on my big screen TV without a cable. I need to upgrade the OS to Windows 10 Professional. I am new to the Virtual Reality gaming systems but I did a ton of research on the VR systems and determine that the HTC Vive is the best VR gaming system out there. The only thing I am concern about is the number of wires that go with the HTC Vive system. I saw on YouTube where some companies are developing a wireless system to use with the HTC Vive. What do you think? Should I wait to purchase the HTC Vive until the wireless technology is perfected?